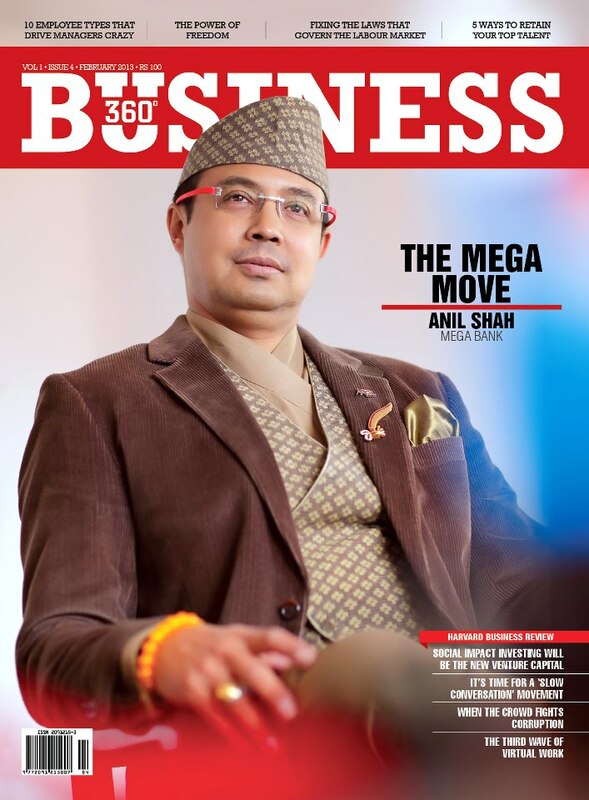 * This is my article for Business 360, published in Kathmandu, Nepal, early this month. Power outages of 12 hours a day or more is one formula for slow economic growth if not economic contraction. Almost all aspects of modern life, industrialization and agricultural modernization require stable and affordable electricity. 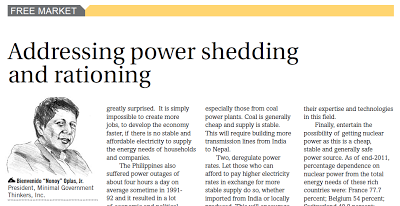 When Charu Chadha informed me that Kathmandu suffers from 14 hours a day of power outages in early January and is projected to rise to 18 hours a day in the coming weeks, I was greatly surprised. It is simply impossible to create more jobs, to develop the economy faster, if there is no stable and affordable electricity to supply the energy needs of households and companies. The Philippines also suffered power outages of about four hours a day on average sometime in 1991-92 and it resulted in a lot of economic and political instability. What the new administration at that time did was to get some private power companies to produce electricity at the soonest possible time at high rates with long term contract. Expensive electricity from power barges were brought in within months. Power black outs were slowly addressed but electricity rates have increased. The public adjusted to the higher electricity bill per kWh and made some adaptations like energy conservation and using more efficient and low wattage bulbs. Shops and companies that must remain open and lighted for many hours a day have no choice but endure the higher monthly electric bill. Later the power outages slowly disappeared. Besides, such rates are still lower compared to buying and maintaining power generator sets that are not only noisy but also very costly as they are powered by gasoline or diesel. From an outsider looking in, here are some lessons that may be considered by the Nepal government and other sectors of society. One, facilitate and hasten more power imports from India especially those from coal power plants. Coal is generally cheap and supply is stable. This will require building more transmission lines from India to Nepal. Two, deregulate power rates. Let those who can afford to pay higher electricity rates in exchange for more stable supply do so, whether imported from India or locally produced. This will encourage faster construction of more power generation plants and transmission lines. Those who can afford higher rates from new power plants will get out, partially or fully, of the old power plants, leaving the latter some respite to serve the poorer sectors that want the old, cheaper rates. Three, privatize some power plants that produce more losses than revenues for the government, sell to private power companies in a competitive bidding. Such privatization should be coupled with industry deregulation, at least the power generation sector, to encourage more competition among various players. Four, reduce the requirements, bureaucracies, taxes and fees for companies putting up new power generation plants and transmission lines. 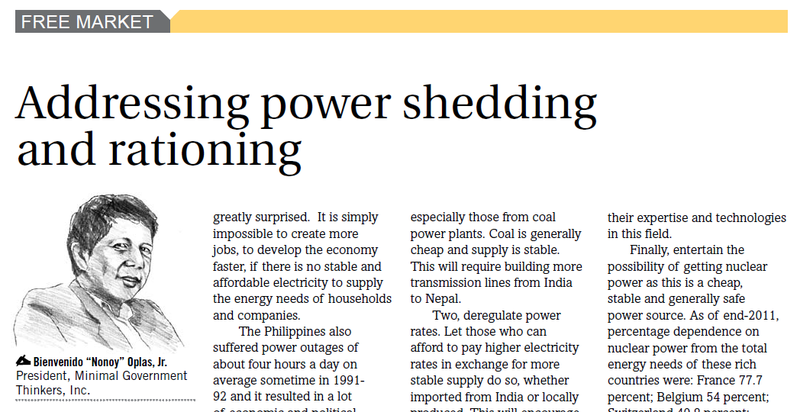 Invite more power supply companies from many countries to enter Nepal and put up more power generation and transmission infrastructures over the medium- to long-term. Norwegian and other Scandinavian power companies are generally efficient producer of hydro power plants as they are largely dependent on hydro power from huge amount of water from melting ice after winter. Nepal can benefit from their expertise and technologies in this field. Finally, entertain the possibility of getting nuclear power as this is a cheap, stable and generally safe power source. As of end-2011, percentage dependence on nuclear power from the total energy needs of these rich countries were: France 77.7 percent; Belgium 54 percent; Switzerland 40.8 percent; Sweden 39.6 percent; S. Korea 34.6 percent; USA 19.2 percent; Japan 18.1 percent; UK 17.8 percent; Russia 17.6 percent. See http://www.world-nuclear.org/info/reactors.html. Hydro-dependent Norway buys power from Sweden during winter when rivers and lakes are mostly frozen and the hydro power plants are resting. After winter, Norway exports electricity from its many hydro power plants to Sweden and other neighboring countries in northern Europe. People from many countries though, the Philippines and Nepal included, are still wary of nuclear power plants because of safety concerns. This is a scientific and engineering problem with scientific and engineering solutions, as reflected in high reliance in nuclear power by the above-mentioned rich countries. Nepal has a huge potential for industrialization and can retain its high profile mountaineering tourism. These must be sustained if not boosted, by easy availability of stable and cheap energy. Our regional and global health alliance, the Emerging Markets Health Network (EMHN), has republished a paper that was released February 2012 by the Free Market Foundation (FMF) of South Africa. MG Thinkers was a co-publisher of that paper. See here, Free Trade 24: Trade and Improving Health Outcome (February 15, 2012). 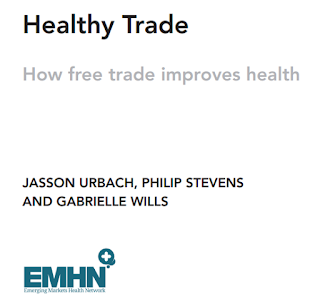 EMHN Executive Director, Philip Stevens, partnered with two young economists from South Africa, Urbach and Wills, in producing this econometric paper. A recurrent theme of the academic literature and wider public discourse is that free trade harms the poor by promoting economic inequality and insecurity, polluting the environment and making processed foods more widely available. All of these factors are deemed to be deleterious to health. Contrary to much of the literature, our analysis finds that free trade does in fact promote better health outcomes, with the relationship particularly pronounced for lower-income countries. There are two mechanisms that might be responsible for this relationship. On the one hand, trade promotes economic growth, which in turn provides greater sums for individuals to improve their living conditions and for authorities to spend on public health measures such as sanitation and universal vaccination. Another mechanism is ‘knowledge spillover’, wherein international trade increases the global diffusion of both knowledge and products that improve health -- ranging from the basics of germ theory to modern pharmaceuticals and medical devices. It's a better and cool explanation than the trade-paranoid argument. More trade means more options, more choices for the consumers including patients. Less trade means less options, simple. 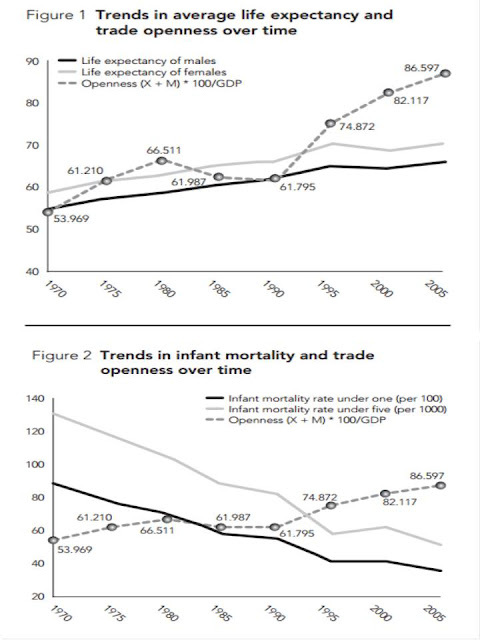 These two charts are self-expalanatory: more trade means more economic activities, more wealth for the people and thus, the average life expectancy is rising. The second chart shows that more trade, more economic prosperity translates to less infant mortality. See the full, 16 pages report here. 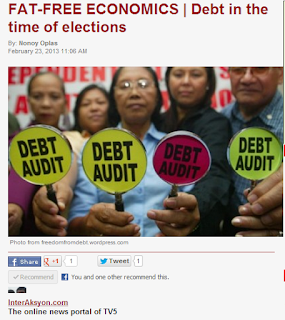 The outstanding debt of the Philippine government has breached the P5 trillion mark sometime in March 2012. By the end of last year, the debt was P5.437 trillion. This means that on average, each of the 96-plus million Filipinos as of that period had a per capita debt of about P57,000. Not a good figure to hear. Aside from the outstanding debt, there is also the guaranteed debt or “contingent liability” that is not part of the former yet, but if the indebted GOCC or GFI (government financial institution) cannot pay the debt guaranteed by the national government, it will migrate to the outstanding debt and hence, will be paid by the taxpayers through present taxes and fees, or by future taxpayers through new debts. At end-2012, guaranteed debt was half a trillion pesos. The P2 trilllion mark in outstanding debt was breached in 2000 or possibly in 1999 during the Estrada administration. Then the P3 trillion mark was reached in 2003 or on the third year of the Arroyo administration. The P4 trillion level was reached in 2008, and as mentioned above, the P5 trillion level was attained last year or on the second year of the PNoy administration. The national outstanding debt is rising by about P1 trillion every four years on average, according to the Bureau of Treasury. The distribution of the rise and fall of the total debt yearly is uneven. The first four years of the Arroyo administration, 2001 to 2004, were marked by a huge jump in the outstanding debt, which mainly implied heavy borrowing. Those years were also marked by political instability due to the various political scandals and impeachment moves against President Arroyo and the presidential elections in 2004. The next three years were characterized by low growth or even contraction in the outstanding debt, only to pick up sharply again by 2008. *Author's computation based on Bureau of Treasury data. The big jump in outstanding debt in 2012 did not seem to look consistent with the high GDP growth that year, unless one will argue that such fast growth was made possible by heavy government spending in important social and economic activities, which is debatable. Nonetheless, the economic optimism should be seized by the Aquino government to drastically cut its borrowings and reduce the outstanding debt. Finance programs with existing tax revenues and encourage more private sector involvement and risk-taking in both hard and social infrastructure development. In the normal life of the average citizen, debts and other obligations are paid during the good harvest years so that when the bad harvest comes, the debt stock is low or manageable enough. This convinces lenders that the borrower is prudent and responsible enough not to court financial disaster in the future due to ever-rising debt, whether or not harvest is good. In turn, the borrower is charged low interest rates and afforded longer payment terms and debt refinancing. The opposition is expected to seize on this ever-rising debt, both total and per capita, as an election issue against the administration. And rightly so because to tell voters that even their young kids have a per capita debt of nearly P60,000 would evoke disappointment if not anger at the administration. The latter should therefore assure the public that this ever-rising debt phenomenon has to stop somewhere, and as soon as possible. Let us hope that this year would be the start of a reversal of this ugly debt rise momentum. 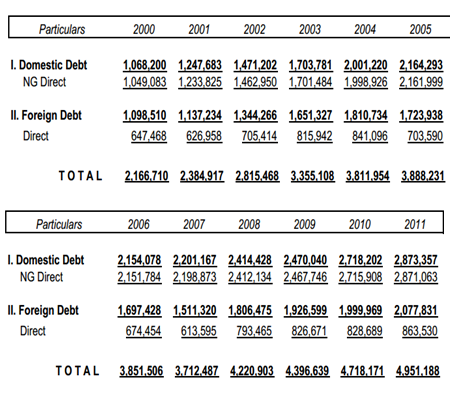 Here's the total public debt, 2000 to 2011, in Million Pesos. From the Bureau of Treasury (BTr, DOF). Tuesday this week, an article from the Inquirer, Filipino horror story, was circulated and shared in facebook and other social media. It was written by Dr. Korina Ada D. Tanyu, 27, a pediatrics resident at the Philippine General Hospital (PGH). It was indeed a heart breaking story about a five years old boy named Jamjam from a poor family in Cavite, who has been coughing for two months already, later losing weight and has recurring fever. The mother brought him to the health center, the boy was given carbocisteine, the cough continued and he kept losing weight. The nearest hospital to them is privately owned and the consultation fee is at least P500, aside from the costs of the lab tests. The nearest government hospital according to the author is in Manila, the PGH. After two months of this bad condition of the boy, the mother brought Jamjam to PGH. At first she was turned down because the hospital’s emergency quota of 60 new patients a day on top of old and returning patients has been reached. One doctor attended to Jamjam that day seeing his bad condition. They found out that Jamjam has tuberculosis complicated with severe pneumonia; the infection has spread through his blood. When he was brought to the PGH, his condition was already very serious. After several attempts by the doctors and nurses at the ER resuscitating Jamjam that day, they failed. Jamjam died. A heart breaking story. I commented at the walls of my friends who posted that story, that the main problem was the lack of health insurance by that poor family. The government barangay health centers are supposed to be the de facto health insurance for the poor because they can go there for free treatment, but the health center only gave the boy Carbocisteine, an anti-cough syrup without checking what caused the cough in the first place. The barangay health centers should provide primary treatment. If they cannot handle the situation, say they suspect that there is a bigger cause to a symptom, they should refer the patient to government secondary or even tertiary facilities, like the municipal health center or a district or provincial hospital. It seems that the barangay health center did not do this job, and the government provincial hospital seems far from the family’s house. When the parents endured for two months not to bring the child to a physician due to poverty, the disease has already mutated to something serious. Pneumonia is actually easy to treat, if detected early. Some anti-biotics plus regular hydration and good rest would usually allow a patient to recover from the disease. But if pneumonia has become severe, even hospital treatment can be too late. There were discussions to increase really high the budget of the PGH and other DOH hospitals. 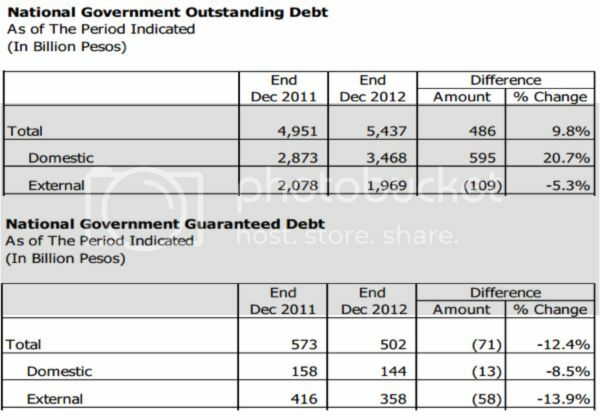 This might help, and assuming that the government has no big public debt to grapple with. But the more cost-effective way to solve a similar case like this is to improve preventive healthcare through a reliable and competitive health insurance system for all households especially the poor. Health insurance especially for outpatient services should be deregulated. PhilHealth card is often useless for outpatient services. One can use it only if he/she is already hospitalized, when the disease is already serious and the patient is about to die. For diseases like pneumonia or TB, patients can be treated at home provided that correct diagnosis and treatment is given. When the condition has become complicated, that is the time to bring the patient to a hospital for confinement. Community (barangay or municipal level) or private health insurance in a deregulated environment where there are plenty of competing players, is the solution. Government can pay for the annual premium of the poor and the latter can look for a private or NGO health insurance provider, instead of maintaining inefficient or costly health centers. In the case of Jamjam, can the family complain of the barangay health center for just giving them Carbocisteine instead of referring them to a district or provincial hospital early enough? Government healthcare monopolization and nationalization is wrong. In the food sector, there is no government restaurant or carinderia corporation, no government supermarket or talipapa, all such shops are private, and people are eating. Compare that in healthcare where there are about 40,000+ barangay health centers, hundreds of provincial, district and city government hospitals, dozens of DOH hospitals, dozens of hospitals from other agencies (AFP hospital, PNP hospital, Veterans hospital, UP-PGH, etc. ), there are thousands of government pharmacies (Botika ng Barangay, Botika ng Bayan) there is drug price contro policyl, mandatory discount for senior citizens, there is government health insurance monopoly, etc. And healthcare problems are expanding, not declining. Repeated statement and plea of "not enough public spending on healthcare" is wrong. Maybe they can talk of "not enough PGH budget" as the story above has illustrated and that is true. But overall, nationwide, public healthcare is among the heavily budgeted, and most probably, heavily wasted sector. There are lots of government spending on healthcare already via (1) DOH, P53 B this year alone, (2) PhilHealth with P100+ B in reserve funds alone, (3) LGUs, from provincial health centers and hospitals down to barangay health centers, (4) other agencies' spending like UP-PGH, AFP hospital, PNP hospital, etc. (5) Health spending by different agencies for their personnel and their respective dependents, and (6) PCSO and PAGCOR support, indirectly through LGUs’ and DOH hospitals (usually free ambulance, mobile clinics) or directly to patients in the form of hospitalization cover. When I was working at the House of Representatives in the 1990s, our healthcare protection was OA. Consider this: (1) we have PhilHealth membership with huge employer (HOR) contribution, (2) we have private HMO, Intellicare at that time, I don’t know now, and HOR is paying for the annual premium of all employees, and (3) we have a medical and dental office right at the HOR with full time doctors, dentists and nurses, with free basic medicines, etc. All this spending for healthcare by the HOR for its officials and employees is not counted as “public health spending” but “legislative spending”. 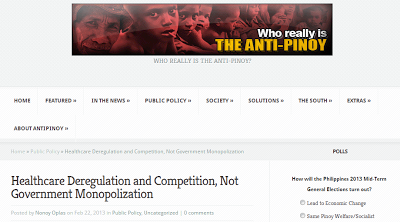 So when the WHO, ADB, WB, UN, etc. would say that the Philippines’ health spending / GDP ratio is only 3% or so, they are wrong, the numerator they use – DOH spending, PhilHealth disbursement, estimated private sector spending, etc. – is understated. They miss health spending by all other government agencies, local to national, that are not included in the numerator. The mining is perhaps the most regulated, most intervened, and most taxed sector by the government. Coming second would be the pharmaceutical sector, and perhaps the water and other utilities. One important indicator that there is heavy government regulation and taxation of a particular sector is the high presence of the informal or black market for such sector. In the case of mining, the black market is the high presence of the so-called "small mining" like in Mt. Diwalwal in Davao. In the pharma sector, it's the existence of so many unregistered "health products" like the "magic coffee" (or tea, juice, etc.) that can treat all types of cancer, TB, diabetes, and two dozens or more of other diseases, or even the fake and substandard medicines. Last November 27, 2012, I attended the Philippine Economic Society (PES) 50th Annual Conference held at the PICC in Manila. In the afternoon session, I attended the panel on Mining Taxation. There were several speakers, like the IMF Philippines Country Director, one from the Asian Institute of Management (AIM), one from the DENR Mines and Geosciences Bureau (MGB), another one from UNDP I think, and the Chairman of the Chamber of Mines of the Philippines (CMP), Dr. Artemio Disini, also of the UP College of Engineering. Of the various presentations, the most substantial for me was the paper by Dr. Disini. I got a copy of his powerpoint, posting here some of those slides. I will post the slides on mining taxation in another blog post as it seems to be the most controversial aspect that will require legislation. 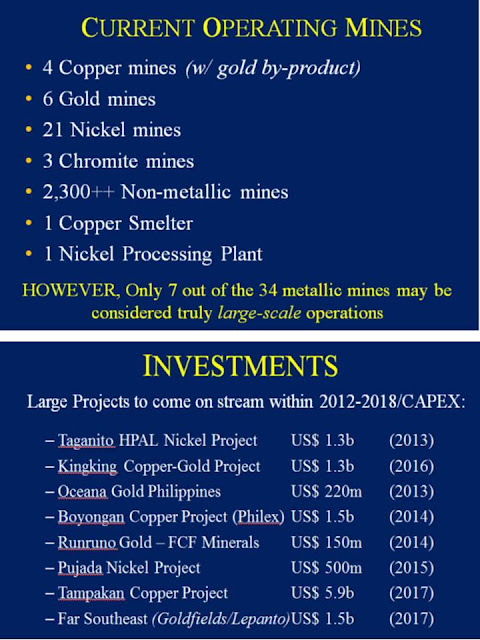 From Dr. Disini's presentation, there is indeed huge investment, both actual and planned or potential, in the Philippine mining sector. See these two slides below. Please note again that these data were as of November 2012. There could be some slight changes in the data by now, am not sure. The biggest is the Tampakan project by Sagittarius Mines, Inc. (SMI). Almost $6 billion, wow. It's a weird case. The company has already started so many infrastructures when suddenly the provincial government of South Cotabato passed a resolution banning open pit mining, so the operation was halted. You pour huge amount of money and human resources and suddenly one branch of the government, the provincial government, says "Stop!" wow. I read today that Finally, Tampakan mine environmental clearance okayed. 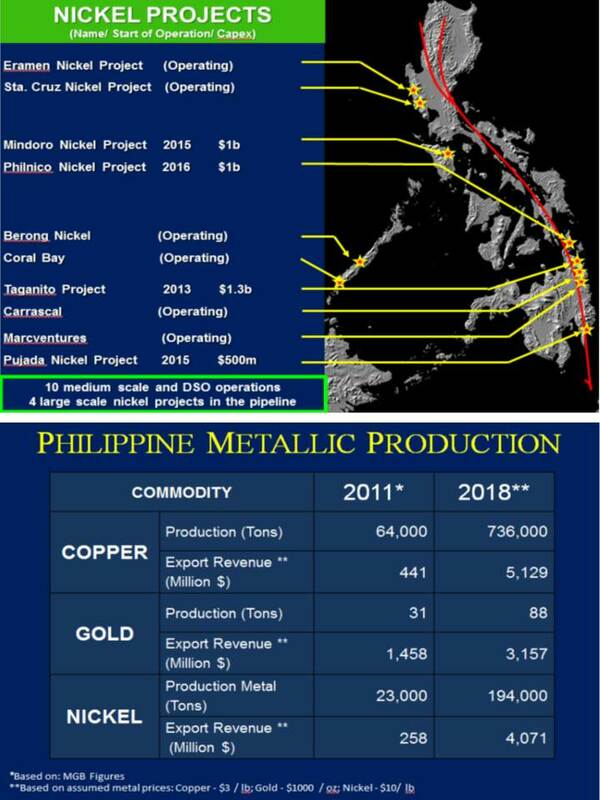 But still the company cannot operate because the moratorium on mining is still in effect unless a new law on mining taxation and other matters is enacted. 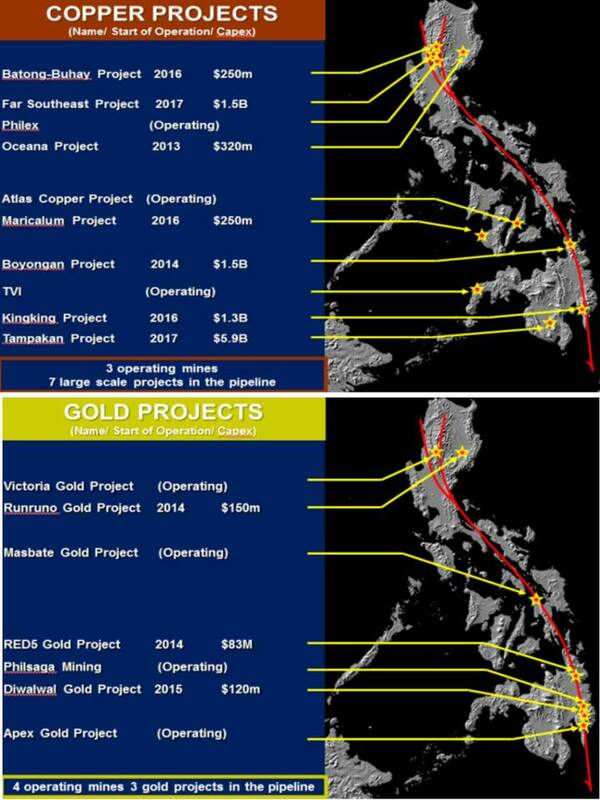 Below is a good map of where the big copper and gold mining projects are located. In copper mining, only three companies are operational while seven are still waiting for the final go signal from the government. Companies in gold projects are "smaller" compared to copper projects. For nickel, the four companies still on the pipeline are pouring huge money, average of some $1 billion each. The projected exports revenues of those companies in the 3 metallic products would reach some $12.3 billion by 2018, that's a big amount indeed. But that is still a big IF because industry players, both existing and potential, cannot really predict what the legislators in the Senate and House of Representatives, as well as the Governors and Mayors in the provinces, will do with their existing and proposed investments. The only saving grace of the Philippines perhaps is its geology. In the "Pacific Rim of Fire" where about 80 percent of all earthquakes and volcanic eruptions in the planet occur, those volcanic and other geological movements would turn ordinary rocks beneath the surface into something precious metallic rocks. 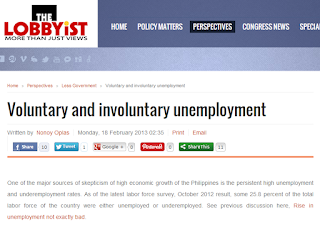 One of the major sources of skepticism of high economic growth of the Philippines is the persistent high unemployment and underemployment rates. As of the latest labor force survey, October 2012 result, some 25.8 percent of the total labor force of the country were either unemployed or underemployed. See previous discussion here, Rise in unemployment not exactly bad. There are two main reasons why a person is unemployed. One is that he is rejected due to under-qualification or over-qualification (may demand higher pay later on), and two, he chose not to be hired at a particular job description and pay. The first is involuntary unemployment, outside the control of the job applicant while the latter can be considered as voluntary unemployment, within the control of the job applicant. 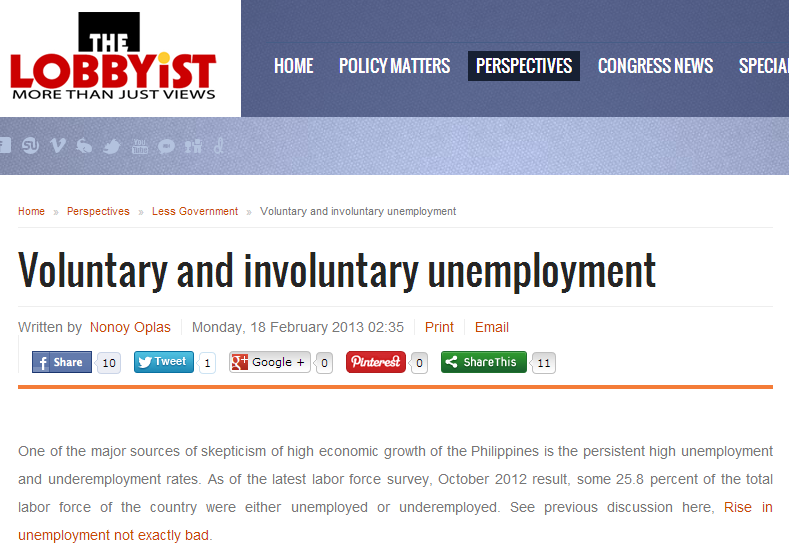 This explains the “voluntary unemployment” phenomenon. There are jobs available for many college graduates but they chose not to take those jobs, at least temporarily, hoping that a job related to their course, or a higher paying job, or a job near their house or city, would be available soon. Here are more numbers, notice the high incidence of unemployment among college graduates. Most economic literatures analyzing the unemployment phenomenon focus on what the government should do to improve the employability of the population, the college graduates especially. Thus, the favorite policy interventions and proposals are higher spending in government education from elementary to tertiary. The K+12 education has recently been implemented. This is the mandatory kindergarten + 12 years in elementary and high school, or 13 years of schooling before a student can go to college. There are several problems with this approach. One is that there is high focus of training students to become employees, to be “more employable” someday and less as entrepreneurs and job creators themselves. Two, there is lack of trust in self-learning by students with the help of modern technology. Self-learning as augmentation to school education is a good training ground for self-employment and entrepreneurship someday. Instead, students are mandated to spend more years in the schools, in government elementary and secondary schools especially. And three, there is high additional cost to parents as well as to public spending with the extension of mandatory elementary and secondary education to 12 years. As if there is no huge budget deficit every year and the public debt stock is not rising every year. Both voluntary and involuntary unemployment among college undergrads and graduates would have been lower if these young people were trained for self-employment and entrepreneurship early on, and if government policies are more business friendly than they are now. This means that government business permits and bureaucracies, business taxes and fees, both at the local and national government levels, should be reduced and/or made simpler. The high incidence of informal economy or underground sector micro and small entrepreneurs is a clear proof that government business bureaucracies and taxes are simply high and complicated. The key to reduce unemployment, both voluntary and involuntary, is more entrepreneurship, more business competition, freer markets in all factors of production – labor, capital, technology, land – and not more government debts and bureaucracies, more stifling taxes and fees. 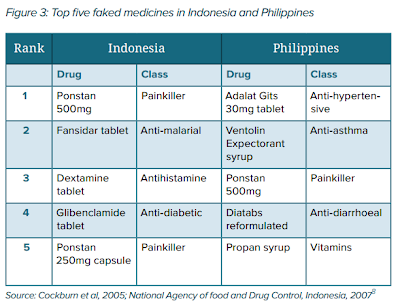 Fake medicines - which are either criminally motivated or the result of lax manufacturing standards - are a worsening problem, particularly in Asia. In some of poorer parts of the continent, up to a quarter of medicines fail quality tests. of what legally constitutes a fake medicine. Below is one of the graphics contained in the report. About 40 percent of the pharma crime incidents in 2011 occurred in Asia, followed by Latin America and Europe. I am just wondering why incidents in Africa constituted only three percent of the total. This could be a result of under-reporting of such incidents in Africa, or other factors. The presence of counterfeit or substandard drugs is a problem here in the Philippines. One time, an anesthesiologist friend told me, a patient was lying on the operating table, surgeons were about to slice his tummy, so the anesthesiologists come first before them. The injected substance is supposed to make the patient feel numb and sleep, within minutes. But after giving the necessary dosage, the patient was still awake and numbness was light. He would be shouting in pain if the surgery would proceed. They realized that they got a fake or substandard anesthesia from one local pharma company that was purchased by the hospital. Right there and then, they scrambled to get another anesthesia as the surgery must proceed that day, otherwise the patient's condition will deteriorate. So the doctors wrote tot he FDA in a confidential letter to complain about the product of this local company, and the latter knew about their letter, they must have a "mole" inside the agency. This company threatened to sue the doctors for criticizing their company. I offered to write about the story but the physicians were hesitant to give me full details as it is still under FDA investigation. 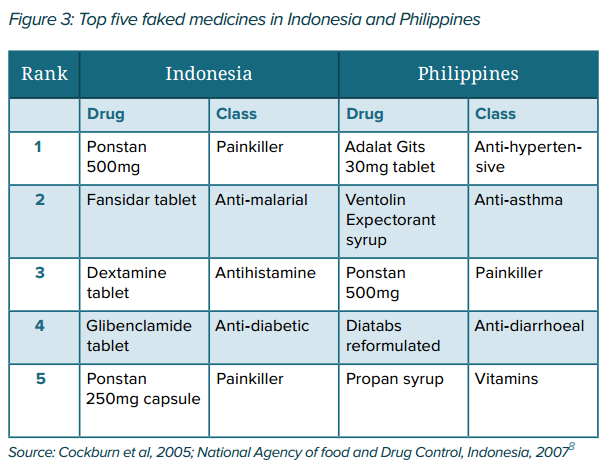 The report did mention about the case of fake medicines in the Philippines. In countries where the rule of law is weak, the creation of new regulatory layers and tougher criminal sanctions may be counterproductive, as new powers for regulators create opportunities for bribery and corruption. To be effective, stiffer criminal penalties depend on an efficient and fair rule of law, something which does not exist in many Asian countries, particularly the poorer ones which have the greatest problem. Stronger criminal penalties will likely drive activities further into the hands of organised criminal cells and will also likely result in further corruption, as the criminal cells seek to infiltrate law-enforcement agencies. 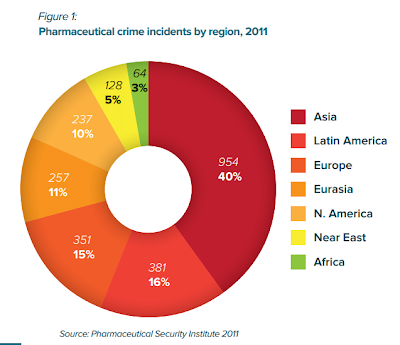 The fake medicines trade is already showing worrying signs of mafiaisation, with organised crime groups such as Chinese triads and Mexican drug gangs all becoming implicated in the trade over the past decade. More effective solutions must address its fundamental cause, which revolve around the inability of legitimate manufacturers to protect the integrity of their brands. Legal reforms can go some way towards addressing these problems, as can innovative uses of technology. Protection of intellectual property rights (IPR) like patent and trademarks, enforcement of existing laws against such bad practices, or simply promulgate the rule of law, is the best thing that governments can do, not the creation of new and more regulations and laws. Civil society groups concerned with or engaged in public health issues would better focus their energy more in battling this bigger problem of proliferating fake medicines, instead of circumventing or disrespecting IPR. As the report noted, the more faked medicines are the known branded generics more than the innovator drugs. EMHN is a project of the Institute for Democracy and Economic Affairs (IDEAS) in Kuala Lumpur. 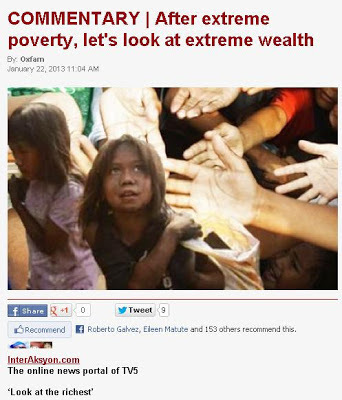 * This is my article today in TV5's news portal. One of the never-ending criticisms of the country's recent economic performance is that it was a “jobless growth” or “elitist growth." The people who say this refer to the lack of sufficient jobs created in the economy and hence point to further social inequality. Last week's column has attracted similar skeptical comments in social network sites, such as “growth for the rich”, “what growth, growth of the urban slums,” “gobbledygook growth,” and so on. Perhaps it is a case of people being too mired with slow growth in the past, that faster-than-expected economic expansion has become unfamiliar and even uncomfortable for them. There are valid and invalid reasons and premises for such statements. But before we enumerate these premises, let us review some of the latest GDP growth figures for key economies. This is from The Economist magazine, which conducts a quarterly pool of some of the world’s biggest investment banks and rating companies about their GDP and other macroeconomic forecasts, tabulate those forecasts and get the average. The Philippines’ full year 2012 growth of 6.6 percent is nearly a percentage point higher than the 5.9 percent projection. A week before that and prior to the announcement of the fourth-quarter 2012 GDP growth, the average forecast for full-year 2012 by The Economist was only 5.5 percent. This is a bit unusual because in most cases and in many countries, actual numbers are about +/- 0.5 percent maximum divergence from projections, the Philippines’ is 0.7-1.1 percent higher than the average forecast. 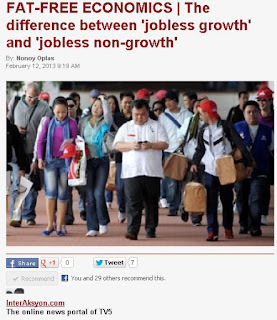 If the Philippine economy grew slow, like Hong Kong and Singapore’s 1-1.3 percent third-quarter growth, or even contracted to -1.5 to -6.9 percent like what happened to the Netherlands, Italy, Greece and Spain, the complaints of “jobless growth” may have turned into a remark like “jobless non-growth” -- a not-so gratifying situation. 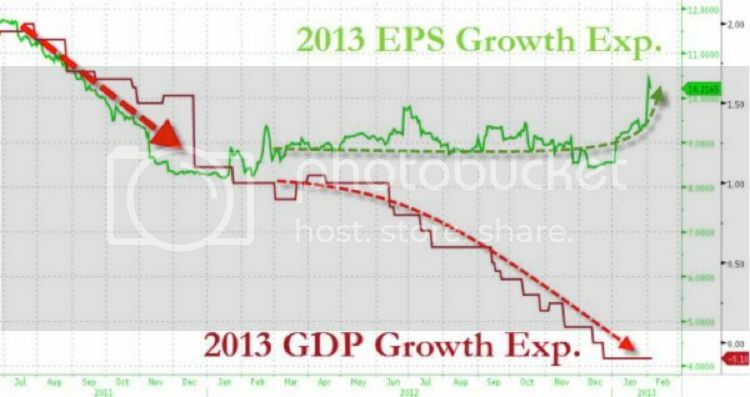 See this graph for instance, showing the big disconnect between expectations of stock market growth and GDP growth this year. 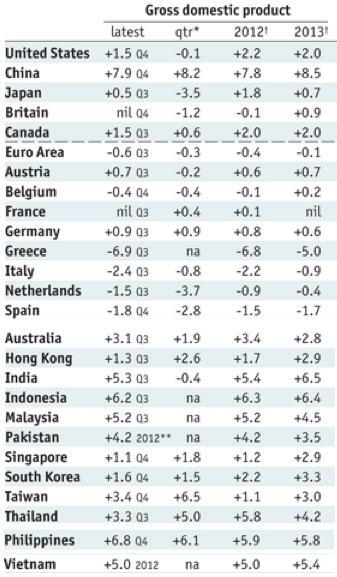 Source: Zero Hedge, Europe’s WTF Chart, February 5, 2013. The European Central Bank simply threw money at almost everything while the fundamentals remained gloomy. Expectations like these in such a big continent like Europe can drive some if not many businesses there to head out for other more promising economies. The Philippines should be one of those emerging markets where their financial radars are currently directed. So, can “jobless growth” really happen and is it theoretically possible? Yes, it is a theoretical possibility and can happen if the number of the employed people has remained the same while the output of enterprises has increased due to higher productivity (more automation, improvement in production processes, more personal motivation) and the number of people in the active labor force has increased. There were no net job losses that occurred, it is just that the new entrants to the labor force were not absorbed and hired mainly by the formal sector. The next question will be thus: Is this happening in the Philippines now? There are mixed signals based on the latest labor force survey (LFS) data as of October 2012. Compared to October 2011, the unemployment rate was higher at 6.8 percent last year compared with 6.4 percent in 2011, and the number of unemployed people was 2.76 million in 2012 compared with 2.64 million the previous year. If compared two years ago in October 2010, unemployment in 2012 was tame and lower: 6.8 percent unemployment rate compared with 7.1 percent in 2010, and 2.76 million unemployed compared with 2.80 million in 2010. A rise in unemployment also does not always mean that many job applicants are rejected. An improving overall economic condition also produces job seekers with rising “reservation wage” For instance, they are offered a monthly pay of P20,000 but they did not grab it because they are waiting for a possible job call that will give them a P25,000 monthly pay. So when the LFS was conducted during that period, they were still unemployed, as argued in an earlier column. 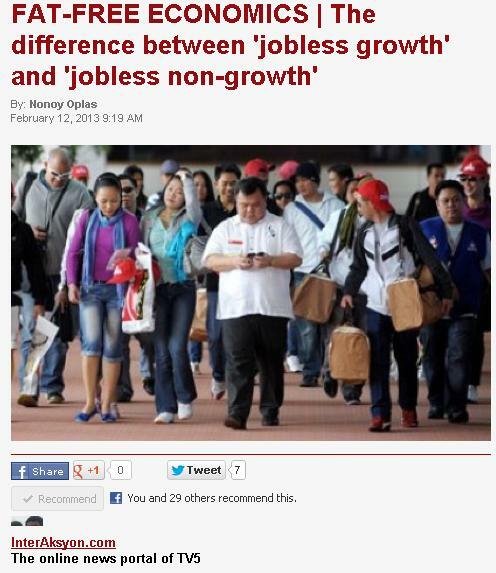 There are valid and invalid criticisms of a “jobless growth” phenomenon, actual or imaginary. Perhaps the quickest way to dispel this is for the government to encourage more self-employment or entrepreneurship among the people. If some people harbor a high reservation wage for long, the rational thing to do is for them to employ themselves. This will require that government must reduce certain procedures, permits, taxes and fees for people to start and maintain a business. Credit is relatively easy these days with interest rates at very low levels. The 91-day Treasury bill rate -- the benchmark for loans -- is down from about 4 percent just three years ago to the current 0.05 percent. There is a need to sustain the overall economic optimism in the country. 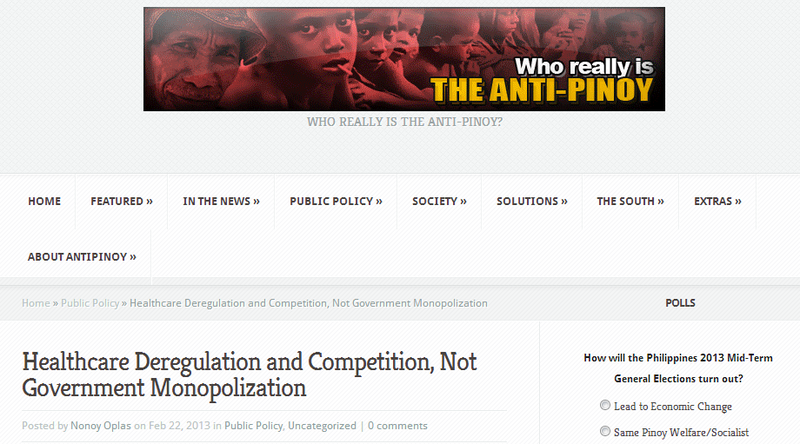 People abroad are beginning to see it, but Filipinos have yet to feel it. Attaining universal health care (UHC) for all Filipinos is among the key social reform programs of the government. 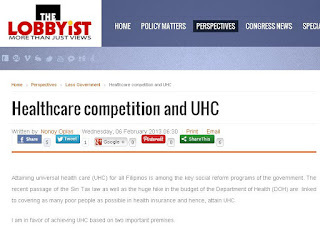 The recent passage of the Sin Tax law as well as the huge hike in the budget of the Department of Health (DOH) are linked to covering as many poor people as possible in health insurance and hence, attain UHC. I am in favor of achieving UHC based on two important premises. One, everyone -- from newly born babies to the oldies in this country, employed or unemployed, married or unmarried -- should have a health insurance. And that everyone should have his/her individual health card, not just the heads of family as currently practiced by the Philippine Health Insurance Corporation (PHIC or PhilHealth). 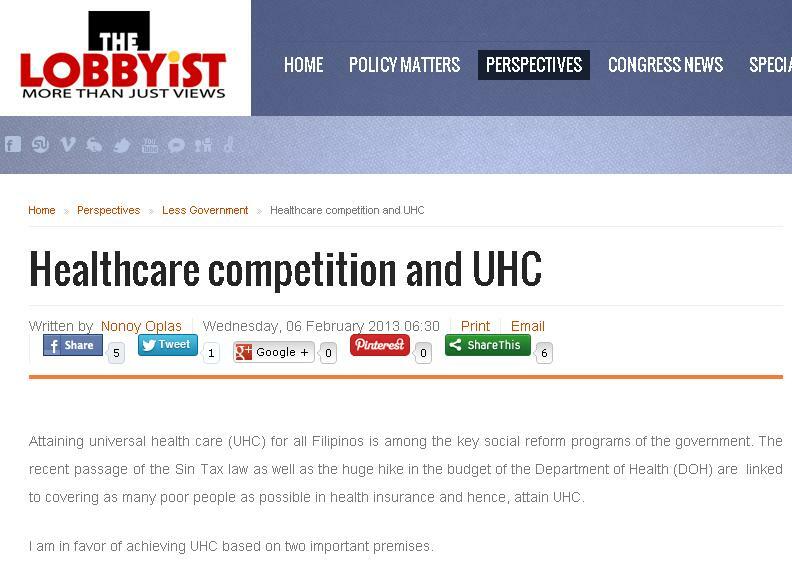 Two, UHC does not mean government monopoly of healthcare like PhilHealth. Competition among various healthcare providers – corporate health insurance firms, health NGOs, health cooperative, barangay or village health insurance, municipal or city health insurance, and so on – is possible and feasible. In the few remaining days of Congress in session, many civil society organizations are pushing the passage of a bill expanding the powers of PhilHealth. I saw the signature campaign and I was not impressed by this bill, Senate Committee Report No. 49 or SB# 2849. It does not seem to have major value added to existing and recent developments. First, the DOH budget has been rising by an average of P10 billion annually in recent years: P24.65 billion in 2010, P31.83 billion in 2011, P42.08 billion in 2012, P53.06 billion in 2013. Second, the new Sin tax law is estimated to provide P31.35 billion for UHC this year alone, and about P154.56 billion by 2016 or P39 billion a year on average. This is on top of regular appropriations for DOH allotted for UHC. Third, there are increases in mandatory contributions to PhilHealth: (a) those in the formal sector, from 2.5 percent to 3.0 percent of salary; (b) the sponsored program and non-poor informal sector, from P1,200 to P2,400 per annum; and (c) for OFWs, from P900 to P1,200 per annum. These three measures mean only one thing: more money for UHC every year and they are already in place and implemented even without a new law from Congress. So there is little, if any, value added by proposed bills on PhilHealth. Now, there are certain PhilHealth policies that limit or restrict the attainment of UHC itself. Among them are the following. c. parents who are below 60 years old, even if they are jobless and just taking care of the grandchildren or a sick child. The above mentioned groups of people must get or pay their own PHIC membership. Two, even if members have been religiously paying for many years, but they suddenly forgot or became unable to pay one or two months and thus have not fulfilled the "9 months straight payment" prior to hospitalization, they and their dependents immediately become ineligible for PHIC hospital reimbursement if suddenly one family member is hospitalized. These technicalities partially defeat PhilHealth's goal of 'UHC for all". In statistics, PhilHealth reports that they have covered as many Filipinos as possible, that they have covered 85 percent of the total Philippine population. But in reality, PhilHealth wants to exclude as many people and hence, pay as few members as possible. If PhilHealth is serious in covering as many Filipinos as possible, it should remove those exclusions. How can they serve many people if they also exclude as many as possible from the benefit or hospitalization reimbursement system? It is somewhat puzzling why the PhilHealth Board and administrators have not thought of bridging that service gap. They did not remedy this even though this problem did not happen yesterday or last year, but since PhilHealth was created in 1995 or 18 years ago. It is also not true that PhilHealth has attained "85 percent UHC coverage” of the Philippine population, What they did in coming up with such conclusion is that they assume that all members have one or two dependents, so they made a two or three multiplier for each PHIC member. This is wrong and not feasible as many members are young and unmarried, or married but have no kids yet, the older ones may have kids but already 18 years or older. See a longer discussion here, PhilHealth Watch 14: Not Yet 85 Percent Coverage. Instead of healthcare nationalization and monopolization, we should have healthcare competition. One way to do this is for the DOH to issue a healthcare voucher for all people, say P5,000 per person per year. Thus, a household of four members, couple plus two kids regardless of age, will get a P20,000 per year healthcare voucher. Let the households and the people choose where to get their health insurance. To private health insurance firm A or firm B, or to health NGO C or D, or to company insurance E or F, or to Barangay or village insurance G or H, or to municipal/city health insurance I or J, or remain with PhilHealth, and so on. In the food sector, there is no government restaurant or carinderia corporation, no government supermarket or talipapa, all such shops are private, and people are eating. People have options where to eat or buy cooked and uncooked food. The same policy can apply in healthcare while government does not let go of its big role in public healthcare. Different healthcare providers, private or civil society or local governments or PhilHealth, are competing with each other to attract the public. The opportunists and greedy will lose clients, the efficient and service-oriented will attract lots of clients. There are issues raised against private health insurance, that they promise high hospitalization coverage when in fact they pay only after the PhilHealth hospitalization coverage. This is true as these private firms charge lower premium to people who are PhilHealth members. What the private health insurance providers usually give that PhilHealth does not give, are: (a) annual medical check up, a form of preventive healthcare, (b) dental services, (c) unlimited physician consultation for outpatient services, (d) free diagnostic tests for basic services when necessary, like chest X-ray, blood test, urine/stool lab test, and so on. In case of hospitalization, (e) additional payment after PhilHealth deduction in the total bill. Where there is healthcare monopoly, options for the public is limited if not zero. Even if PhilHealth services and health coverage are not good, people have to contribute to it monthly by force and coercion. Certainly, competition among different healthcare providers is the way to ensure efficiency and non-costly healthcare delivery to the public. Egalitarianism is very definitely not a feeling but an intellectual construction. I don't think the people at large really believe in egalitarianism; egalitarianism seems to be entirely a product of the intellectuals. -- Hayek, Interview with Bork (1978). Social inequality is a result of diverse ability, efficiency and motivation of people. Those who are more creative and innovative in producing more output from limited resources will earn more than the others. And those who are more motivated, more ambitious in producing something that is so innovative and revolutionary, and they later become successful, will also become more wealthy than the rest of society. So the wider the gap of efficiency and motivation among people, the wider the inequality becomes. Forcing equality among people in society as is done in socialist countries tend to produce more poverty than wealth. This happens because by penalizing creativity and efficiency and subsidizing irresponsibility and inefficiency, the system of economic rewards and punishment is corrupted. If people can eat even if they do not work, why should they work hard, or even work at all. Free people are not equal and equal people are not free. If people are free to dream high, to work as hard and as efficiently as possible, and some people are free to bum around, to sleep and party as often as possible, then inequality among people will widen. Forcing equality means putting a gun on some people’s head that they should not excel compared to the rest of society. The politics of envy implicitly embedded in these advocacies does not recognize the benefits to humanity produced by the super rich. Among such people are Microsoft founder Bill Gates, facebook founder Mark Zucerberg, google founders Larry Page, Sergy Brin and Eric Schmidt, and youtube founders Chad Hurley, Steve Chen and Jawed Karim. Have these people helped create economic inefficiency, political corrosion, social divisiveness and environmental destruction in the process of their giving us facebook, google, youtube and Microsoft? So that their excess wealth and privileges should be subjected to extra taxes and regulations by governments? This is a doubtful if not mistaken assertion. Here in the Philippines, multi-billionaires Henry Sy, Gokongwei, Lucio Tan, the Ayalas and many others have become super rich not only because they founded or developed businesses that were patronized and deemed useful by millions of Filipinos like SM, Robinsons, PAL, Ayala Land, Globe, Smart, and other big businesses. In addition, they do not have enough competitors because of Constitutional limitations and prohibitions on foreign equity ownership on certain sectors of the economy. There is nothing wrong with being a multi-billionaire if this is achieved through useful invention that benefits humanity. Actual examples are the discovery of facebook, google and youtube. Take also this hypothetical example. Supposing a bunch of science geeks and nerds make a grand ambition to create or invent a rice or potato variety that is packed with certain nutrients and vitamins that will improve or boost its consumers' immune system against certain infectious diseases. It is like an indirect vaccine against certain diseases minus the injections. Various laboratory and clinical trials prove that their invention was successful -- safe, effective, no negative side effects, etc. Their rice and potato variety has become a worldwide hit, the geek inventors are selling their rice at P100 per kilo equivalent, and millions and millions of people worldwide are buying their rice, the geeks became super-super rich, they became multi-billionaires. By simply inventing products and services that are proven to be useful to people, rich and poor alike, these businessmen have already done their part in helping humanity. It is presumptuous to say that all the super rich only amass their wealth only for their personal and selfish needs, that they are incapable of donating their wealth to the poor, so governments must confiscate a big portion of their wealth and government politicians, officials and bureaucrats, and favored NGOs will redistribute such wealth to the poor. This is wrong. There are many examples that very rich people voluntarily give away their wealth to the poor, at their chosen projects, programs and terms, not as dictated and prioritized by government politicians and officials. The Bill and Melinda Gates Foundation (BMGF) gives away $4B a year on average, perhaps in perpetuity, for health charity alone. If Bill Gates' money was confiscated early on by the US government due to envy or simply because it is a "sin" to amass too much wealth, that foundation's money and global health initiative would not have been possible. There is also this interesting story of a “nomad billionaire”, Nicolas Berggruen, who as of mid-2012 has a £1.5 billion fortune but plans to give away half of his wealth. He has bought £881m stake in Burger King but he owns no house, no car, not even a watch and carries things in paper bag when he travels. Class envy and resentment should be curtailed and people should not be penalized for their success. When some people become very rich, their wealth pale in comparison to the greater wealth enjoyed by humanity as a whole through the higher standard of living that the inventions and production of the rich have enabled. Profit from successful businesses are not hidden in cabinets or idly parked in banks for long. Those profits are reinvested and plowed back into the national and global economy either by expanding the business and hiring more people, or by buying and consuming various products and services, which support other businesses that also hire other people. If we want prosperity for as many people as possible, allow the producers to produce more, the innovators to invent more, the job creators to hire more. Make things easy for them, do not allow the politics of envy via more regulations and taxation to expand endlessly.